Crossing into Vietnam from Laos was a lot easier than we expected. We were imagining high bribes to pay and endless questions about what we were doing leaving with two Vietnamese motorbikes. Turns out they didn’t care. Not even a secondary glance and they sent us on our way. Which is lucky, because now we got to explore another country on our motorcycle adventures in South East Asia! 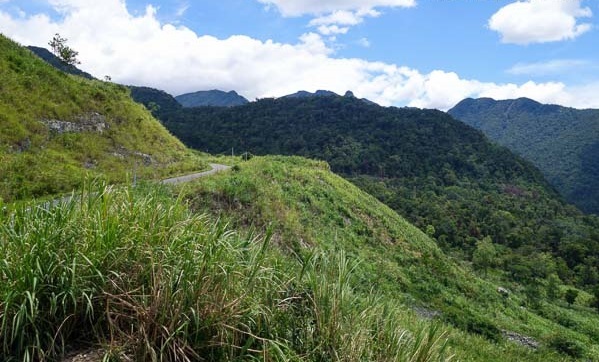 The roads in Vietnam varied from treacherous, muddy, high-traffic highways to deserted mountaintop pavement. Right when we were ready to give up from the terrible road conditions, a new detour would restore our faith ten times over! While we could only explore a little bit of this amazing country this time, we will be back later in the year. 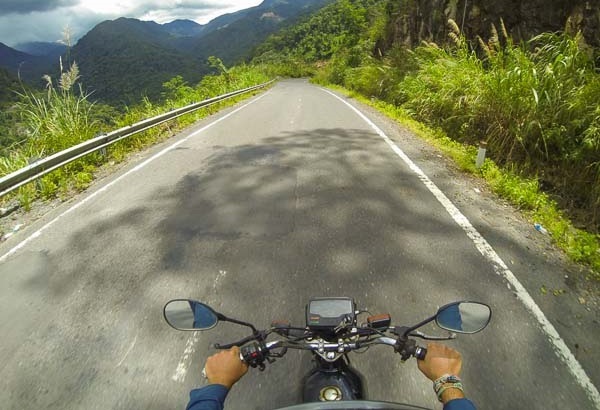 For now, our Southern Vietnam motorcycle adventures will keep our enthusiasm rising. Views from the Laos border to Kon Tum. 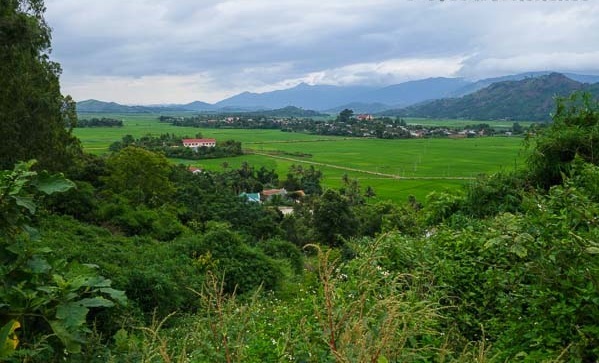 After the lush greenery on the Laos side of the border, crossing into Vietnam made way for wider, busier roads and the scenery traded the wild vegetation for rolling hills and farmland. The roads were well maintained until we made it to Dak To. At that point the Ho Chi Minh Road started to become under heavy construction, slowing the speed of travel down considerably. Large trucks and buses added to the traffic and unfortunately the views gave way to buildings and roadside rubbish. Road Condition: Fine with pot holes when we left the border then down hill from there. Such a bad road about 50km from Kon Tum. Road works everywhere. Lots of dust and gravel. Traffic: Just crazy. Everyone was everywhere because of the road works. What the road was like for most of the time. Unfortunately this was the most depressing stretch of road we have ever ridden on. Probably at least 40% was a muddy, potholed mess as the highway is being renovated. We could barely ride 3km on paved tracks before we had to slow right down to make our way through more roadworks. The traffic was heavy and due to the road constantly merging into only one lane we constantly found ourselves being pushed off into the verge. We were only offered fleeting views of the beauty behind the trees and buildings but for the majority of the ride it was ugly. If we had to do this trip again we would avoid the Ho Chi Minh Road at all costs. Road Condition: Terrible. Roadworks, potholes, heavy traffic. Fuel Station: Kon Tum, every few kilometres. Buon Ma Thuot to Dalat. After the nightmare that was the previous two days we decided to take a detour off the HCMC Road towards the French colonial city of Dalat. 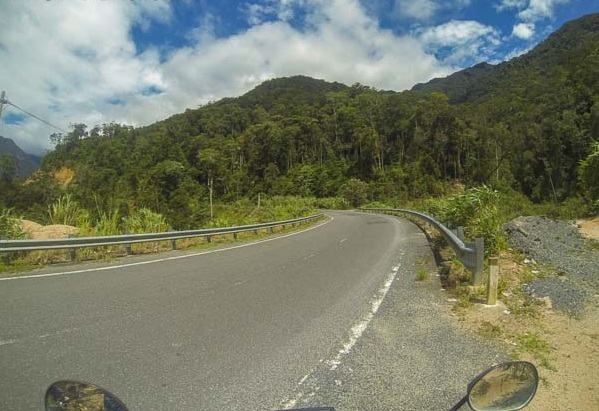 This choice completely restored our faith in motorcycling in Vietnam! Almost instantly we were rewarded with beautiful vistas off rolling hills and lush farmland. Traditional villages peppered the route and the road conditions were brilliant. We couldn’t wipe the smiles off our faces as we stopped regularly for photo opportunities. Riding into Dalat we took a back road and it took us up through some steep roads surrounded by forest. Our first glimpse of Dalat was of old European-style buildings around its famous lake. Despite the heavy rain we had rode into, we had our breath taken away! Road Condition: Fairly good. Road works now and then. Fuel Station: Boun Ma Thout, plenty of others. We had been promised by a friend that taking the road from Dalat to Nha Trang would be one of the greatest rides we could do in SE Asia. After completing it, it is easy to understand why. 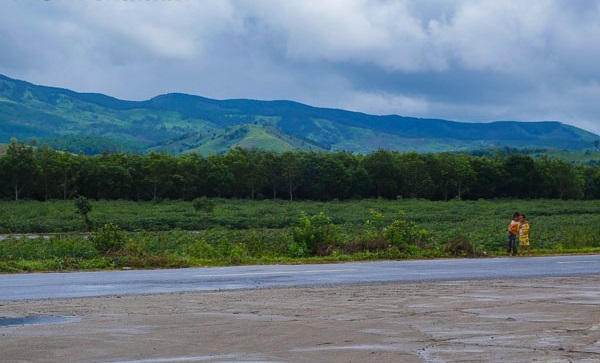 Starting in the cool highlands around Dalat you ride though fragrant pine forests, weaving through small towns until you reach the start of your descent towards the ocean. You are rewarded with views down the valley between mountains and hills. The road the follows the gradient of the slopes, winding and twisting its way down to sea level. Eventually you catch glimpses of rivers and thinner vegetation as farmers take control of the land. Arriving on Highway 1 the traffic increases beyond imagination. Palm trees and manicured hedges dotting the median strips give the feeling that you have finally reached the beachside city of Nha Trang. 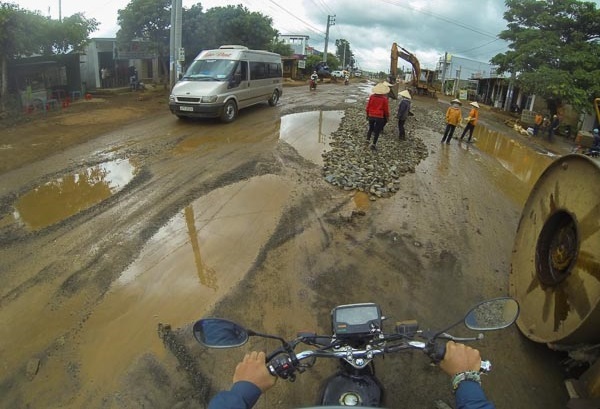 Road Condition: Good with pot holes and road works coming out of Dalat. After that almost perfect. Fun ride. Weather: Little chilly at the beginning then the sun came out. Awesome. Fuel Station: Dalat, a few in small towns. 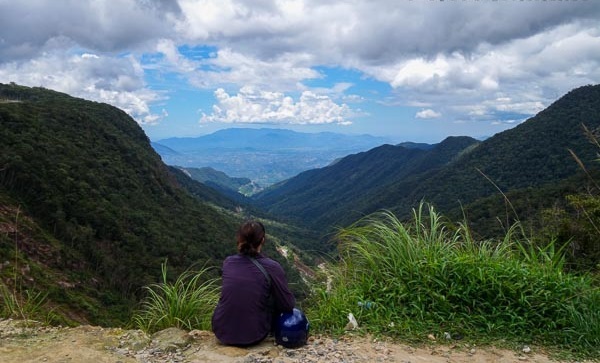 Lesh enjoying a rest break on the stretch from Dalat to Nha Trang. Nha Trang to Bao Loc. We decided to backtrack on the same road we took from Da Lat, that’s how beautiful it truly was. 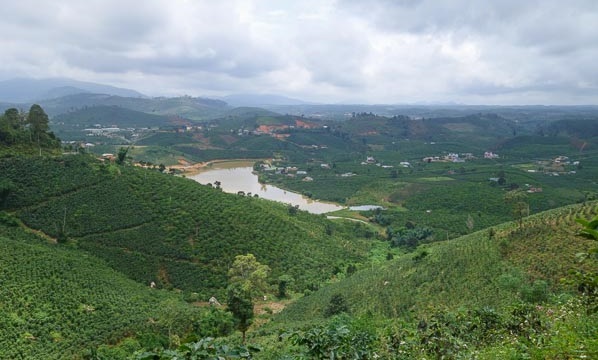 Once we arrived in Dalat we took a quieter road towards Bao Loc. We stayed high up in the mountains enjoying the typical views we had become used to in the highlands – pine trees, valleys and steep inclines. Once we reached the plains the towns became more frequent and traffic steadily built up. The scenery remained pleasant all the way to Bao Loc. Road Condition: Good again with the odd pot holes. Road works coming into Dalat. Weather: Overcast with little showers now and then. Ho Chi Minh Traffic – a quiet part of town. We rode through a small village that was the gateway to an amazing mountain pass. We experienced heavy rain and fog during this stretch but it added to the mysticism of riding through the mountain. The ride from then on was nice enough. Not spectacular but still enjoyable. Unfortunately we ended up on Highway 1 and its intimidating shitfight of traffic and noise. In between the towns were more rural scenes, which was a nice way to break up the urban sprawl. The last 30km into the city took nearly two hours due to the heavy traffic. Admittedly after all the hype we had built up in our minds from stories of nightmare traffic, we found it wasn’t as bad as we expected. Road Condition: Not too bad with a few pot holes. Highway the whole way with some road works now and then. Weather: Not good. I think we went through 7 different storms this day. Traffic: Busy, busy and busy. oh wait did I say busy because it was busy. Fuel Stations: Bao Loc, just about every few kilometres. Outside HCMC, where the road was still beautiful. On the border of Cambodia. Jazza on the ferry across the Mekong. Lesh is nowhere to be found. More highway riding to exit the city for the first 80km, then we began to enter the picturesque Mekong Delta. The river breaks up into many estuaries where life on the Delta is thriving for the Vietnamese people. 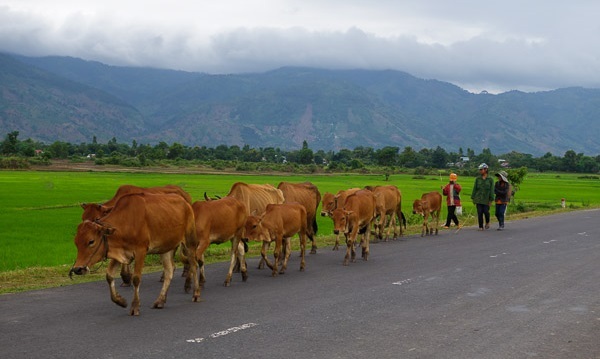 A mix between busy towns and quiet farmland, but the traffic never really let up until we got past Chau Doc. We had to cross the mighty river on a car ferry at one point, where I got separated from Lesh, never to know if we would see each other again. We did. The last stretch to Cambodia was vacant and green and built up the excitement for our next adventure. Road Condition: Fairly good, a few potholes now and then. Mainly highway with a ferry crossing. Weather: Clear, no rain today, sun was shining, sunscreen on. Traffic: Pretty quiet for Vietnam. It was busy but not chaotic.